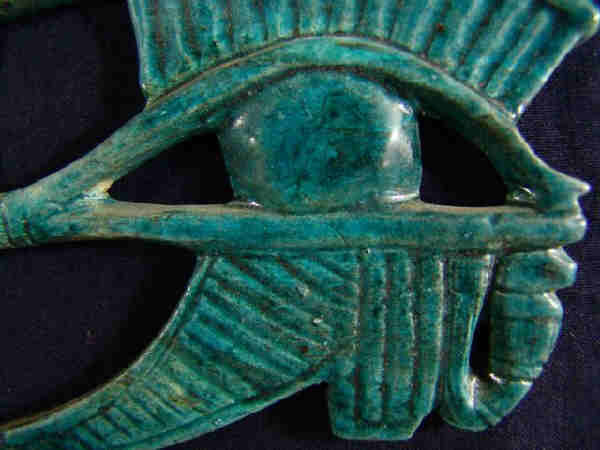 Ancient Egyptian "Faience Eye of Horus Amulet"
The above listed item is from the Late Period,(715-332 B.C.E.). 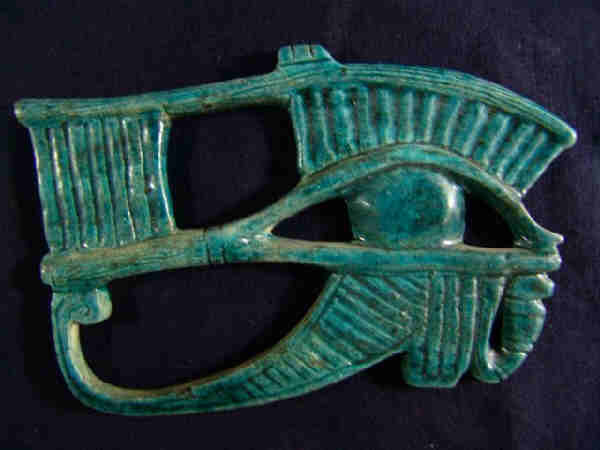 This lovely "Eye of Horus" amulet was clay cast and then faience glazed. We acquired this beautiful piece from a select private collection and its provenance is Alexandria, Egypt. What is unique about this eye is is the designed of the eye resembles a human face upon where the Uraeus and eye lid meet! The item is intact, has retained all of its lustrous blue faience glaze and it has areas of age wear. This is a very different design and carried a great protection to the ancients that wore them, living or dead! This is a lovely gift for anyone during the Holiday Season! The reason for the item being available is due to the vast extent of archeological findings, thousands of years in Egyptian burials and also the proliferation of these said items in older private collections worldwide. Our company strives to provide our customers with the most interesting, unique and quality Egyptian artifacts! Our company spends a great deal of time researching and investing monies on private acquisitions to make these items available to you, at a low auction price. We continuously work at improving the quality and variety of our merchandise. You have nothing to lose so, Bid with the Utmost Confindence!". Dimesions : Height:8.6cm Width:12.6cm Depth:0.6cm.